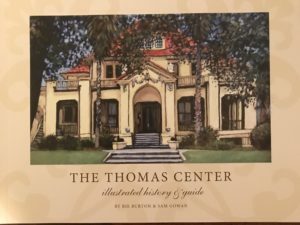 THE THOMAS CENTER: An Illustrated History and Guide, is an enchanting coffee-table book that depicts the historical journey of The Thomas Center, from its origin as a home, then hotel, then junior college, to its place as an evolving social and cultural center, and award winning wedding destination. It is filled with captivating stories of the Center and will transport you through time in a celebrated depiction of Gainesville’s beloved treasure. In 2016 the Thomas Center Associates undertook the updating of the book originally authored by Rie Burton and Sam Gowan in 2001. With support from an Arts Tag Grant awarded by the City of Gainesville, a generous unnamed donor, and funding from the Thomas Center Associates, the book underwent a graphic updating with additional stories and photo contributions from many friends of the Thomas Center. The book received its official copyright in 2017 from the U.S. Library of Congress and a copy resides today in the Thomas Jefferson Building in Washington, DC.